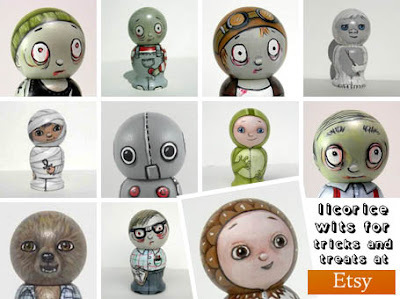 What you are looking at are just some of the creepily cute creations from Licorice Wits. Licorice Wits is an Etsy shop that makes monstrously cute kokeshi dolls that are just perfect for Halloween. Vampires, werewolves, and scarecrows are all in attendance. And, I’m more than happy to report, it’s even got zombies too! Well… what’s Halloween without zombies? Enjoy!